Lesbos (, ; Greek: Λέσβος Lesvos, [ˈle̞zvo̞s]), sometimes referred to as Mytilini after its capital, is a Greek island located in the northeastern Aegean Sea. It has an area of 1,633 km2 (631 sq mi) with 320 kilometres (199 miles) of coastline, making it the third largest island in Greece. It is separated from Turkey by the narrow Mytilini Strait and in late Palaeolithic/Mesolithic times was joined to the Anatolian mainland before the end of the last glacial period. Lesbos is also the name of a regional unit of the North Aegean region, within which Lesbos island is one of five governing islands. The others are Chios, Ikaria, Lemnos, and Samos. The total number of inhabited islands governed by the North Aegean are nine: Lesbos, Chios, Psara, Oinousses, Ikaria, Fournoi Korseon, Lemnos, Agios Efstratios and Samos. The capital of the North Aegean Region is Mytilene. The population of Lesbos is approximately 86,000, a third of whom live in its capital, Mytilene, in the southeastern part of the island. The remaining population is distributed in small towns and villages. The largest are Plomari, Kalloni, the Gera Villages, Agiassos, Eresos, and Molyvos (the ancient Mythimna). According to later Greek writers, Mytilene was founded in the 11th century BC by the family Penthilidae, who arrived from Thessaly, and ruled the city-state until a popular revolt (590–580 BC) led by Pittacus of Mytilene ended their rule. In fact the archaeological and linguistic record may indicate a late Iron Age arrival of Greek settlers although references in Late Bronze Age Hittite archives indicate a likely Greek presence then. The name Mytilene itself seems to be of Hittite origin. According to Homer's Iliad, however, Lesbos was part of the kingdom of Priam in what is now Turkey. Much work remains to be done to determine just what was happening and when. In the Middle Ages, it was under Byzantine and then Genoese rule. Lesbos was conquered by the Ottoman Empire in 1462. The Ottomans then ruled the island until the First Balkan War in 1912, when it became part of the Kingdom of Greece. According to Classical Greek mythology, Lesbos was the patron god of the island. Macar was reputedly the first king whose many daughters bequeathed their names to some of the present larger towns. In Classical myth his sister, Canace, was killed to have him made king. The place names with female origins are likely to be much earlier settlements named after local goddesses, who were replaced by gods. Homer refers to the island as "Macaros edos", the seat of Macar. Hittite records from the Late Bronze Age name the island Lazpa and must have considered its population significant enough to allow the Hittites to "borrow their gods" (presumably idols) to cure their king when the local gods were not forthcoming. It is believed that emigrants from mainland Greece, mainly from Thessaly, entered the island in the Late Bronze Age and bequeathed it with the Aeolic dialect of the Greek language, whose written form survives in the poems of Sappho, amongst others. The abundant grey pottery ware found on the island and the worship of Cybele, the great mother-goddess of Anatolia, suggest the cultural continuity of the population from Neolithic times. When the Persian king Cyrus defeated Croesus (546 BC) the Ionic Greek cities of Anatolia and the adjacent islands became Persian subjects and remained such until the Persians were defeated by the Greeks at the Battle of Salamis (480 BC). The island was governed by an oligarchy in archaic times, followed by quasi-democracy in classical times. For a short period it was a member of the Athenian confederacy, its apostasy from which is recounted by Thucydides in the Mytilenian Debate, in Book III of his History of the Peloponnesian War. In Hellenistic times, the island belonged to various Successor kingdoms until 79 BC when it passed into Roman hands. During the Middle Ages it belonged to the Byzantine Empire. In 802, the Byzantine Empress Irene was exiled to Lesbos after her deposition, and died there. The island served as a gathering base for the fleet of the rebel Thomas the Slav in the early 820s. In the 10th century, it was part of the theme of the Aegean Sea, while in the late 11th century it formed a dioikesis under a kourator in Mytilene. In the 1090s, the island was briefly occupied by the Turkish emir Tzachas, but he was unable to capture Methymna, which resisted throughout. In the 12th century, the island became a frequent target for plundering raids by the Republic of Venice. After the Fourth Crusade (1202–1204) the island passed to the Latin Empire, but was reconquered by the Empire of Nicaea sometime after 1224. In 1354, it was granted as a fief to the Genoese Francesco I Gattilusio, whose family ruled Lesbos until it was conquered by the Ottoman Turks in 1462. It remained under Turkish rule, named مدللى (Midilli) in Turkish, until 1912 when it was taken by Greek forces during the First Balkan War. The cities of Mytilene and Methymna have been bishoprics since the 5th century. By the early 10th century, Mytilene had been raised to the status of a metropolitan see. Methymna achieved the same by the 12th century. The oldest artifacts found on the island may date to the late Paleolithic period. Important archaeological sites on the island are the Neolithic cave of Kagiani, probably a refuge for shepherds, the Neolithic settlement of Chalakies, and the extensive habitation of Thermi (3000–1000 BC). The largest habitation is found in Lisvori (2800–1900 BC) part of which is submerged in shallow coastal waters. There are also several archaic, classical Greek and Roman remains. Vitruvius called the ancient city of Mytilene "magnificent and of good taste". Remnants of its medieval history are three impressive castles. Lesbos is the birthplace of several famous people. In archaic times, Arion developed the type of poem called dithyramb, the progenitor of tragedy, and Terpander invented the seven note musical scale for the lyre. Two of the nine lyric poets in the Ancient Greek canon, Alcaeus and Sappho, were from Lesbos. Phanias wrote history. The seminal artistic creativity of those times brings to mind the myth of Orpheus to whom Apollo gave a lyre and the Muses taught to play and sing. When Orpheus incurred the wrath of the god Dionysus he was dismembered by the Maenads and of his body parts his head and his lyre found their way to Lesbos where they have "remained" ever since. Pittacus was one of the Seven Sages of Greece. In classical times Hellanicus advanced historiography, Theophrastus, the father of botany, succeeded Aristotle as the head of the Lyceum. Aristotle and Epicurus lived there for some time, and it is there that Aristotle began systematic zoological investigations. In later times lived Theophanes, the historian of Pompey's campaigns, Longus wrote the famous novel Daphnis and Chloe, and much later the historian Doukas wrote the history of the early Ottoman Turks. In modern times the poet Odysseus Elytis, descendant of an old family of Lesbos received the Nobel Prize. Lesbos lies in the far east of the Aegean sea, facing the Turkish coast (Gulf of Edremit) from the north and east; at the narrowest point, the strait is about 5.5 km (3.4 mi) wide. The shape of the island is roughly triangular, but it is deeply intruded by the gulfs of Kalloni, with an entry on the southern coast, and of Gera, in the southeast. The island is forested and mountainous with two large peaks, Mt. Lepetymnos at 968 m (3,176 ft) and Mt. Olympus at 967 m (3,173 ft), dominating its northern and central sections. The island's volcanic origin is manifested in several hot springs and the two gulfs. Lesbos is verdant, aptly named Emerald Island, with a greater variety of flora than expected for the island's size. Eleven million olive trees cover 40% of the island together with other fruit trees. Forests of mediterranean pines, chestnut trees and some oaks occupy 20%, and the remainder is scrub, grassland or urban. The island has a hot-summer Mediterranean climate (Csa in the Koeppen climate classification). The mean annual temperature is 18 °C (64 °F), and the mean annual rainfall is 750 mm (30 in). Its exceptional sunshine makes it one of the sunniest islands in the Aegean Sea. Snow and very low temperatures are rare. The entire territory of Lesbos is "Lesvos Geopark" which is a member of the European Geoparks Network (2000-) and Global Geoparks Network (2004-) on account of its outstanding geological heritage, educational programs and projects, and promotion of geotourism. This geopark was enlarged from former "Lesvos Petrified Forest Geopark". Lesbos contains one of the few known petrified forests called Petrified forest of Lesbos and it has been declared a Protected Natural Monument. Fossilised plants have been found in many localities on the western part of the island. The fossilised forest was formed during the Late Oligocene to Lower–Middle Miocene, by the intense volcanic activity in the area. Neogene volcanic rocks dominate the central and western part of the island, comprising andesites, dacites and rhyolites, ignimbrite, pyroclastics, tuffs, and volcanic ash. The products of the volcanic activity covered the vegetation of the area and the fossilization process took place during favourable conditions. The fossilized plants are silicified remnants of a sub-tropical forest that existed on the north-west part of the island 20–15 million years ago. The economy of Lesbos is essentially agricultural in nature, with olive oil being the main source of income. 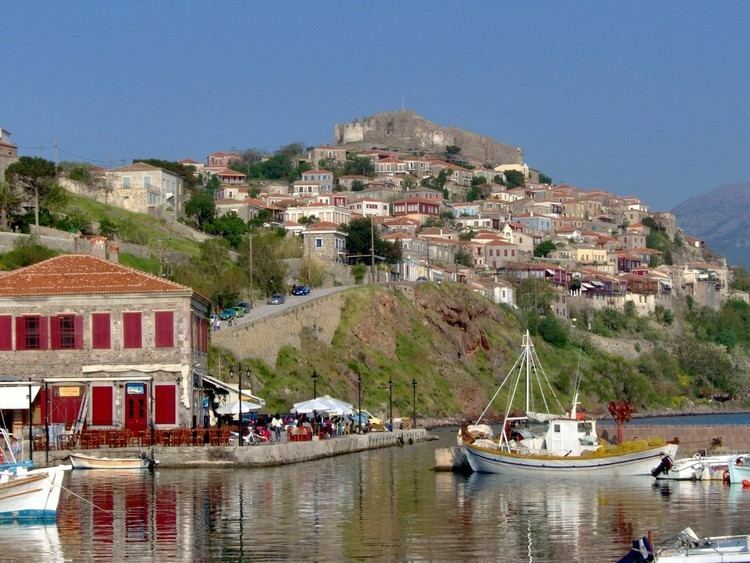 Tourism in Mytilene, encouraged by its international airport and the coastal towns of Petra, Plomari, Molyvos and Eresos, contribute substantially to the economy of the island. Fishing and the manufacture of soap and ouzo, the Greek national liqueur, are the remaining sources of income. In the English-speaking world, the term lesbian is commonly used to refer to homosexual women. This use of the term derives from the poems of Sappho, who was born in Lesbos and who wrote with powerful emotional content directed toward other women. 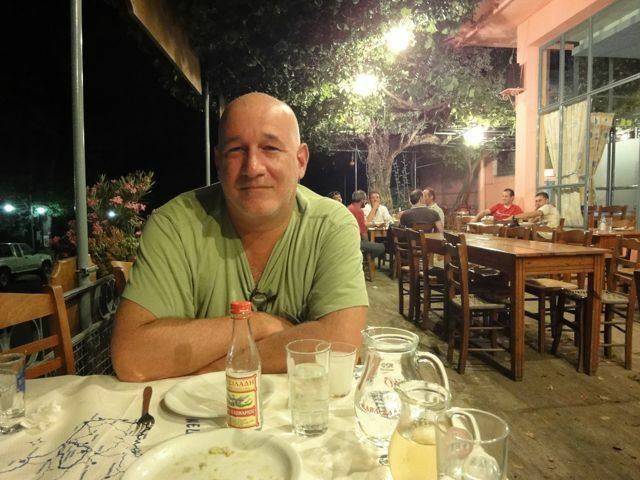 Due to this association, Lesbos and especially the town of Eresos, her birthplace, are visited frequently by LGBT tourists. This use of the term is considered offensive to many Lesbos islanders to such a degree that, in 2008, a group of Lesbos islanders litigated unsuccessfully a court case against the LGBT community of Greece. The islander group had requested a legal injunction to ban groups from using the word lesbian in their names, which the petitioners claim violated their human rights as it is "insulting" and disgraces them around the world. Aristotle (384–322 BC), philosopher, was born in Chalkidike but lived for a time on the island. Constantine IX Monomachos: Byzantine emperor (1042-1055), resident of Mytilene prior to accession.